Cannonical has announced that the next Long Term Support Ubuntu release will have five years of security updates and support for five years on the desktop in addition to the server. In the past, the LTS versions, which come every two years with the April release offered only three years of support. The move is seen as an effort to engage enterprise users whose equipment update cycle is between four and five years. By being able to use a stable, well supported version of Ubuntu’s distribution of GNU/Linux, the hope is that more large organizations will follow the lead of the city of Munich in Germany and corporations like Qualcomm which have made the choice of Ubuntu for their computers. Will this move influence the K-12 school community to consider Ubuntu? Public schools have been slow to change their habits. Some are using Macintosh computers, but most are using Windows operating systems. The version may actually be Windows XP, in many cases. XP is a version of Windows which satisfies most working needs, but it is in its end-of-life stage. Microsoft has urged upgrade to Windows 7. Has your school made the upgrade? What is the impact of reduced budgets? Can your school afford to upgrade? Do you realize that a computer with Windows XP is a good candidate for a GNU/Linux install? Current distributions, including Ubuntu, Fedora, OpenSUSE, etc. would run very well on a machine converted from Windows XP. Schools making the switch would make good use of their current hardware. Tell me your impediments. What’s stopping you? TechDirt published an article which discusses the increasing restrictions of copyright done with law changes, which in some cases are putting works already in the public domain, back under copyright restrictions. To contrast that, the article pointed out the work of others, notably Wikimedia Commons and Flickr which have made created the conditions for and promoted Creative Commons licensing of images. I’m in the middle of a P2PU course examining the methods of using and remixing Open Education Resources (OER). OER depends on the availability of liberally licensed materials. Making a lesson targeted at a particular grade level involves rewriting text, accumulating images, finding audio and video resources, etc. Teachers do this kind of thing naturally. Teachers are professionals at sharing. Sharing is the primary job of a teacher. What OER provides is a way to go beyond the stale textbooks that the district purchased which are often many years old. OER gives the creative teacher a legal way to make activity packets and worksheets which incorporate up-to-date materials. OER isn’t on most educators’ radar screens, though. Maybe some have heard about all the open courseware like the college level courses offered online by MIT, Stanford, and others. But these materials aren’t geared toward third graders or middle school students, maybe not even advanced high school children. Maybe a few have had students read current events from newspapers or have appropriated materials from YouTube to show in class, but to date, not many have actually participated in the creation of OER materials. Why should OER for K-12 happen? Teachers know how to share. OER makes it legal. By contrast, if a teacher takes that current events news story and makes copies of it, the best they can hope for is a “fair use” exception to copyright. Educators can make timely use of such material. The problem happens when the teacher decides to include the same stuff in a second semester, or the next year. That set of copies distributed to a new, later set of students has a far less clear fair use exception to the copyright rules. What will make teachers, particularly at the K-12 level, embrace OER? LibreOffice is about a year old. OpenOffice is now an Apache Incubator project instead of being ruled by Sun or Oracle. No immediate meeting of the minds appears probable between The Document Foundation and Apache. Update: Glyn Moody has made a very important observation. LibreOffice and OpenOffice (along with KOffice and Calligra, among others) center on the Open Document Format, expanding choice around a common file standard. Please use a comment to the post for other statements of concern or lack of concern. Linux was 20 this summer. It is a good day in a good year. Hope your FOSS treats you as well as it has treated me. The icon of modern, hip technology, Steve Jobs is gone. He will be missed. The tech world will change because he will no longer deliver new “insanely great”cool toys. Dennis Ritchie, co-creator of both the C programming language and of Unix while working at Bell Labs, also died. He will be missed, but his work which he taught others to use will have long effect in the tech world, perhaps longer than the Apple phenomenon. Linux is mostly written in C and is a functional homage to Unix. The Ubuntu family of distributions, with its many alternate flavors like Kubuntu, Xubuntu, etc. released its October version 11.10, right on time. I just did my backup and will run the updater after I finish this blog post. 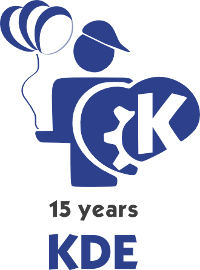 KDE, the desktop originally described as the “kewl desktop environment” is having a birthday on Thursday October 14, 2011. KDE is my personal choice for desktop. I run it in the Kubuntu distribution. KDE is a friendly, interactive community, too. That’s not uncommon in the Free Software world, but KDE seems to do it particularly well for a complex group of programmers, designers, documentation writers and happy users. 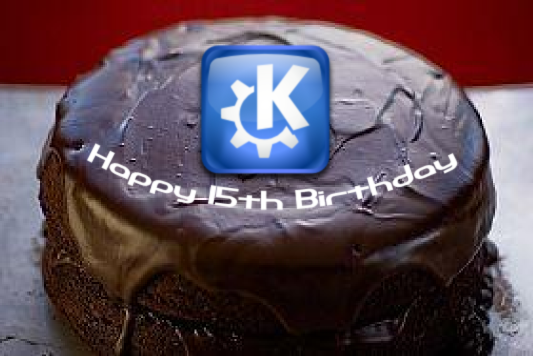 I think I’m the only KDE user in my town so a big party is out, but I plan to celebrate with a raised glass and a piece of cake. After the last post, I realized it had been mainly a rant. This post will provide the alternative of some possible solutions to shackling oneself to DRM and cloud space owned by corporations. Like a lot of things “open”, Linux and Software Freedom are a solution most people don’t appear to care about. Linux hovers somewhere between 1 and 2 percent of desktop deployment. Linux and GNU/Free Software is important in the cloud, however, serving as the most common server operating system of the Internet. The problem is that the “plumbing” of the Internet gets little attention from the public. We plug into an Ethernet wire that disappears into a wall socket at work. We “connect” our laptops to WiFi in the house and at the coffee shop or book store. We use all the standardized protocols to get to some Web site, to data stored on our school or company’s servers, to social network sites, etc. We don’t really care about TCP/IP, HTML, CGI, or if it is a Linux kernel on the servers, routers, not even if it is Linux at the core of our Android phones. It doesn’t matter to most users if a cousin of Linux like BSD or Darwin is under the cover of Macintosh OSX. It doesn’t matter if Windows OS is running at both ends. With the exception of a few nerd/geeks, people who connect don’t care about the stuff that runs their information through the system. Nonetheless, there are the geeks, the nerds, they are the developers of Linux, GNU utilities, and all the rest of open and free software. The programmers of free software are working very hard to provide alternatives to the corporate, proprietary layers built on the open plumbing. They want their data to be free of control by anybody other than themselves. Many people like the quick style of comment and link that Twitter has promoted. In a maximum 140 characters, people are having constructive conversations. Adding the use of hashtags, (#edchat – #sschat – #edtech) makes it easy to follow a message thread from a bunch of people discussing a common topic. Twitter is the popular cloud tool. The software isn’t open. Statusnet is open software. The most well known implementation is identi.ca which is a “competitor” of Twitter. You can deploy your own school or district server. You can make connections to other districts possible, too. This is a concept called “federation.” You “own” your local information and decide what links to establish. Federation is like what happens when you send email. It doesn’t matter who your service provider is. Carl@sample.com can send and receive messages with Sarah@server.org even though the email is hosted by different providers. Facebook is banned as a way to connect teachers and students in many districts. Diaspora might be the answer again. Being open software, Diaspora can be installed on a district server and make the connections more controlled. Federation is in the software plan, too. One nice feature is the ability to create groups called “aspects” which would be perfect for classroom-specific interactions, school level interactions, departmental clusters, etc. Facebook is a walled garden. You are in, all in, or out. Both Tonido and ownCloud offer you a way to store your files in a web accessible location. Easy click to upload and to download. Applications are coming to make more of both systems. Tonido isn’t open source, quite, but you can install it for free. Alternately, you can buy a Tonido Plug, attach a USB hard drive and start it up. ownCloud is in the early stages of development. Stay tuned as it grows more capable. EtherPad lets you work simultaneously on the same word processing document (this technology is built into Google Docs.) EtherPad is great for keeping notes, collaborative study by a group of students. Wikis – There are many choices here. Here’s a good list. Wikis are the tool to use if you want to develop a series of linked documents, like a curriculum with sample lessons, links to core documents, rubrics, etc. WordPress.com offers free blog space, but you can take more control by installing an instance of WordPress on your own server and offer every teacher and student in your school a controlled space for their publishing. None of these suggestions are school specific, of course. They apply to individuals too. You can take charge of your own cloud, just for your family or just for you. You are on the Web, though, so your material is as open as you want to make it. The more you dig in, the more control you can take over your cloud experience. A PC can run Linux and all the open software you want, which you control. Nobody will take away your licenses for the software or the operating system. You don’t sign any End User License Agreements (EULA) which are required for both OSX on Apple computers and Windows of every vintage. ePub is an open format for ebooks. The Nook from Barnes and Noble (all models) can work with DRM ebooks, but also work just fine with unshackled ePub books. Project Gutenberg has thousands of DRM-free books available and there are emerging textbook options using open educational resources (OER). As in many things, these days, the choice is yours. The nice thing is that you do have choice. You may, of course, choose to let Amazon or Google or Apple or Microsoft control your cloud, your computer use, whatever. That is your choice, too. I’m going to keep my eyes open for the opportunities to run as much of my own life through software freedom. Thanks for reading.